Your website has served you well. You’ve paid to have it created by a professional and it provides the basic information about your company and services while giving people the opportunity to contact you for more information. Your website is your business’ number one marketing tool. Often, it’s your brand’s first impression on a potential customer. More importantly, your website is your best opportunity to create a dialogue with your audience. Is your existing site doing absolutely everything it can to effectively convert visitors into leads, leads into customers and customers into evangelists? Here are 10 of the most common indicators that your website is due for a redesign. Time moves fast online. What was fashionable yesterday has today been replaced by something better, easier to use and more intuitive. If your Content Management System (CMS) is outdated or no longer supported, you may be vulnerable to security breaches and hacks. Not to mention finding competent coders to maintain your site can be difficult and costly. In the age of Google, if a visitor doesn’t see exactly what they’re looking for within seconds of hitting your website, you’ll lose them to the next link in their search results. And they’ll never look back. Optimizing your website requires a commitment to ongoing keyword management based on a sound SEO strategy. A redesign is a great chance to align your SEO strategy with your company’s goals. Learning which SEO Tools are most valuable to you is essential in creating a winning SEO strategy. You’ve managed to get someone to visit your website (maybe more than once) but now what? Get them to DO something! A free download of a whitepaper may be the perfect incentive to get someone to provide their contact information. Maybe they want to subscribe to your newsletter. You can provide a link to download a PDF of your latest catalog. By engaging your visitors, you’re more likely to convert them into customers. You can then track your conversions to find out what works and why! As a business grows and evolves to meet challenges and adapt to changing market climates, its audience may change as well. For instance, as a start-up, your main concern may have been to educate the public about who you are and what you do. A couple of years may have passed and you now find that your consumers are more savvy than they once were. It may be time to redesign your site to reflect the change in your audience. Your website has done its job. It’s generating leads, which you’re then able to convert into sales. Things are going so well that you’ve expanded your capabilities. Where you were once happy with small, one-off jobs, your focus has shifted to large, bulk orders. You’re website needs to be able to reflect this change and evolve with your business. More and more, users are accessing websites through their cellphones. Google has recently upgraded their algorithm to improve search results on mobile devices by boosting the rankings of sites that are mobile-friendly. By embracing responsive design, you’re ensuring that whether viewed on a desktop, tablet or mobile device, your site is reaching the widest audience possible. With so many Content Management System options available (WordPress, Joomla, Drupal) there’s no reason to be beholden to a web designer or developer to make edits to your own website. Maybe you’ve lost your login credentials, or the employee that handled the website registration is no longer with the company. With WordPress, the power of updating and editing your website’s content is in your hands! Integrating social media on your site is another way to encourage a dialogue with your audience. It’s fantastic if you’re able to use social media to drive traffic to your website, but even better if once they’re there, you give them the ability to share your content with their followers. This is one way to convert visitors into ambassadors of your brand. In the excitement of getting the latest news and capabilities onto your site as quickly as possible, it’s easy to fall into the trap of adding content to your website without a filter. Your website content should align with your mission and core values. Is your business’ story being conveyed in the most clear and articulate manner possible? Maybe you’ve added so many items to the navigation that the viewer gets confused by where to go to find exactly what they’re looking for. Maybe you’ve added and deleted so many pages over the years that there are actually dead links that don’t go anywhere anymore. 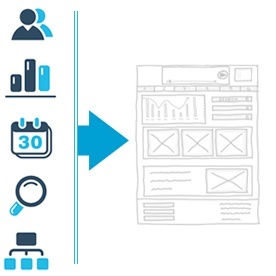 A redesign is the perfect opportunity to reprioritize your content by crafting a sitemap that will deliver a clean and organized user experience. Web standards are continually evolving. What serves as the industry standard today will most likely seem laughable this time next year. If a viewer’s initial reaction to your site is that it looks outdated, they may assume that the content is just as old. Ideally, your website should convey your company as professional, relevant and timely. As a general rule, three to five years is the normal lifespan for a website design. This list is meant to serve as a helpful guide that can encourage an objective analysis and discusion about your website. Ultimately, you're the best judge of whether or not a redesign would help you meet your business goals, but knowing the right questions to ask will help you make more informed decisions.